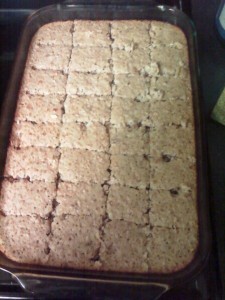 Here is my base protein bar recipe (adapted from Jamie Eason’s Cinnamon Swirl Recipe). Once you have this part down all you need to do is add your own extracts to create your own flavor of bars! I usually do two to three teaspoons of extract per batch. I usually let them cool then put 4 squares in a Ziploc sandwich bag and stick them in the fridge or freezer. They will be good four to five days in the fridge otherwise stick them in the freezer. Add any other flavors or nuts of your choice. These could include nuts, peanut butter, unsweetened cocoa powder, instant coffee, etc. Preheat the oven to 350 degrees. Spray an 8 X 8 inch Pyrex dish with non-stick spray. 1. In a large bowl combine (whisk together) the oat flour, vanilla whey protein, baking powder, the salt, and the Stevia in the Raw or brown sugar xylitol/regular xylitol. 2. In a medium bowl combine (whisk together) egg whites, unsweetened almond milk, the fruit flavored baby food or unsweetened applesauce, and the plain greek yogurt. Add any other flavors or nuts that you wish to add to your protein bars! 3. Add the wet ingredients to the large bowl with the dry ingredients. Mix dry and wet ingredients well. 4. Pour into the prepared pan. 5. Bake for 25 to 30 min or until knife comes out clean when placed in the center. Mine was closer to the 30 minutes but this will vary depending on your oven. Let cool for 10 min. Bars will be dense. (this will vary if you put nuts, peanut butter, or unsweetened cocoa powder in your bars). 4 squares = 1 serving if eating as a small meal. 2 squares = serving size if using as the starchy carb in your meal. This is a simple and delicious recipe that is easy to make your own! I hope you love this base protein bar recipe as much as I do. You can find more of my recipes here!